Nicaragua Tours from Guanacaste, Costa Rica. 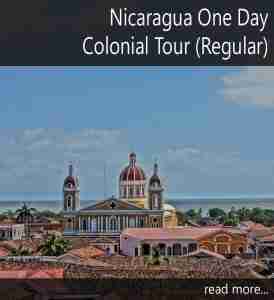 Enjoy our daily tours to Nicaragua visiting Granada, Masaya and, San Juan del Sur. Also, we have trips to Ometepe Island, Leon and other beautiful places in this amazing country. Our tours depart daily from Playas del Coco, Andaz Papagayo, Ocotal Beach, Playa Hermosa, Secrets Papagayo, Riu Guanacaste Hotels and Four Seasons Peninsula Papagayo, Planet Hollywood, and Mangroove hotel. We depart also from Tamarindo Beach, Flamingo Beach, Playa Conchal, Potrero Beach and Hacienda Pinilla inclusive. 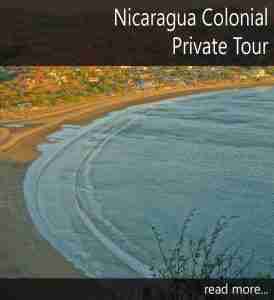 Nicaragua Tours from Guanacaste takes you through a scenic, cultural and architectural journey. Seven active volcanoes, the largest lake sweet water lake in Central America, the colonial cities of Granada & Leon, founded in 1524. Also, we can forget about its beautiful Pacific and Caribbean coasts with incredible beauty are just part of the attractions that Nicaragua offers for a great time during your vacations. Colonial churches, homes and municipal buildings with colonial finishes, craft markets with amazing souvenirs and low prices. To this sum amazing secluded beaches, cigar factories where you can make your own cigar. In addition find excellent food, history, and culture. These are some of the many things to do and discover during our Nicaragua Tours. Our Nicaragua Tours are the perfect way to discover a different country during your vacations in Costa Rica. A place with its own culture, manners and amazing local cuisine besides the colonial buildings and streets full of color, music, and history. Come with us and take a ride on a horse carriage, travel by the Nicaragua lake and its islands, visit by an active volcano Or walk by streets, churches and building full of history. Its proximity to Guanacaste makes visiting Nicaragua for a day or longer a high light in your Costa Rica vacations. If you prefer we can create a customized vacation package including Costa Rica and Nicaragua.